The horrific attack on Professor T J Joseph, whose right palm was chopped off, allegedly by members of the Popular Front of India, is a pointer to spreading Islamic extremism in Kerala. 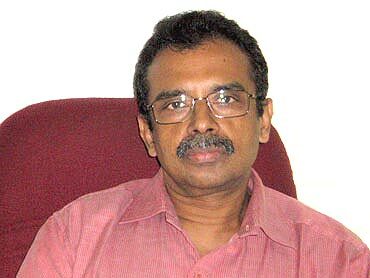 Professor T J Joseph's hand was cut off by assailants on July 4, 2010 in Muvattupuzha while he was returning home from Sunday mass. He was immediately taken to a local hospital, provided first aid and then sent to the Specialists' Hospital in Ernakulam where a team of six doctors reattached his hand in a surgical procedure that lasted 15 hours. The team of doctors was led by Dr R Jayakumar, a consultant plastic, cosmetic and micro-vascular surgeon, who spoke to Rediff.com about the procedure. "Professor Joseph's case was difficult as the tissue of the forearm was cut off. His hand had been cut off at the wrist. He was in shock and we needed 12 bottles of blood." "The family came here very fast and brought the severed hand in a plastic bag full of ice. This is the right procedure. Awareness in Kerala is high about what to do in such emergencies." "We first implanted flesh in the forearm, after harvesting it from his thigh." "To reattach the hand, we first label the structures to be connected. The bones are fixed first and then we connect the tendons. Finally the blood vessels and the nerves are connected." "The operation is considered over only after satisfactory blood flow is restored." "Normally a patient recovers sensation at the rate of 1 mm a day. In a few months, Professor Joseph will recover total sensation and should be out of hospital in a week's time." The surgeon said such surgeries have been conducted at the hospital since 1989. "Every few weeks a similar operation takes place." There are six doctors at the hospital who are all capable of performing the surgery, he added. Professor Joseph's case is an exception; the other cases are caused by accidents. Discussing the time factor between the severing and reattachment, Dr Jayakumar said it depended on the amount of muscle in the amputated part. "For a finger it is 18 hours and other parts it is 10 hours. But I once reattached a thumb after 91 hours (no muscle). With a hand, it should be done within eight hours, if it is cut at the arm then between 6 to 8 hours. More the muscle damage, the sooner you have to do it." Dr Jayakumar's advice to people was that in case of accidents "they should have the presence of mind to collect the amputated part, preserve it properly, give first aid to the victim and then take him to a specialised hospital."